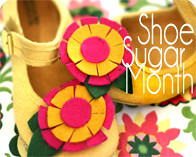 Grosgrain: The Handmaden's Lil' Mim GUEST GIVEAWAY!!!! CLOSED. The Handmaden's Lil' Mim GUEST GIVEAWAY!!!! CLOSED. 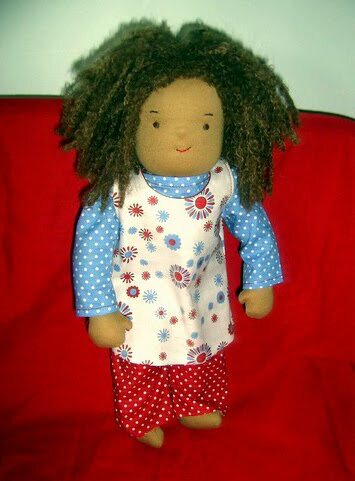 I once made dolls for my oldest daughter Lily when she turned 3. I didn't know how she would take to them but surprisingly she fell in love with each one. I think she liked the fact that they were soft and looked handmade. If you also prefer handmade for your little ones please take a look at today's guest giveaway courtesy of The Handmaden. 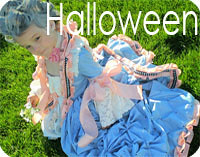 This darling doll pictured to left is named Lil' Mim! And will be loved by one lucky Grosgrain reader. 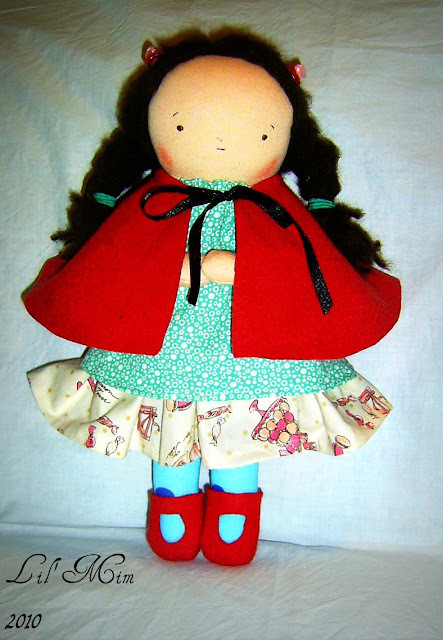 She is 12 inches tall, made with natural materials like cotton tricot and stuffed with clean carded wool. Her hair is alpaca yarn and cape and shoes are hand dyed wool felt. Her clothes are removable. Her character is based on one of her daughters and she is very cute, innocent and often gets herself into trouble! You can expect to see lots of Lil' Mim dolls appearing in her store, each one unique with her own hair colour and style, skin and eye colour and clothing. If you would love to custom make a Lil' Mim doll, please convo Kelly to discuss your particular requirements. Prices start at $60 for a 12 inch doll. 10 inch dolls are also available. 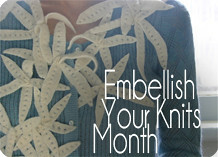 And to learn more about Kelly visit her blog at www.thehandmaden.blogspot.com. Many of you said that you would like to enter more giveaways, but have various issues with linking. Of course, I want anyone that is interested in entering a giveaway to be able to do so. 3) By linking and leaving a comment (this will be worth 2 entries which will better your chances of winning). Find more info under the FAQ page. If you are leaving a link just use the 'create a link' at the bottom of this post or simply creating a post on your blog and including this link. If you use blogger just use the "create a link" link at the bottom of this post. If you don't use blogger, that's fine too. Just create a link on your page as you normally would and I will see it using Technorati. how cute is she?!? my 2 year old daughter loves dolls and would very much enjoy lil' mim to love! She's so cute. I'd love for my littlest daughter to win her. She looks like a best friend. Love to have one as a sewing buddy! Thanks for the giveaway!! they are so cute! My girls would love one. thanks for the chance! I love the second one! I like the little bows in her hair, and her dress is adorable! Lil' Mim is precious! I would love to win her, and I'm sure she would be quite happy with a special little girl to love her! Linked! (www.quite-quotable.blogspot.com) and on my FB page! I'm pretty sure my daughter would love this...actually I know she would. She's sitting on lap as I type pointing and reaching. My girls would love this! She adorable. We are in the process of adopting a little girl and it would be perfect to give her a special baby when she comes to live with us. Absolutely adorable. 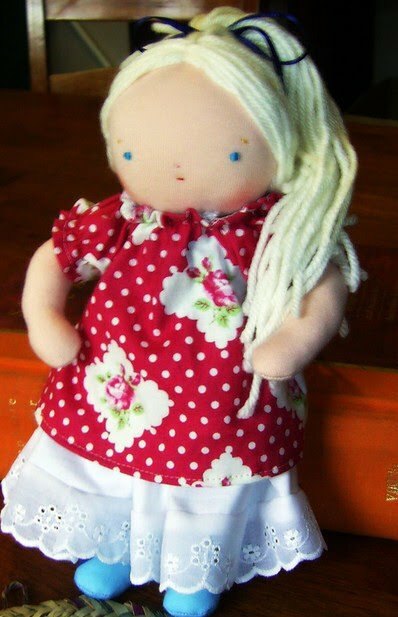 My daughter loves handmade dolls and would love this one, too!! Those are just too too sweet! I love handmade dolls for my 2 year old and these are particularly adorable! Thanks for the chance! SO cute. I'd love one for my newest little miss. Oh, that is a beautiful doll!!!!! Beautiful dolls. I'd love to win one, but not for a child, for my doll collection. such a pretty doll! she would be cherished in this house :) i have two daughters and a son that loves babies :) and i love the handmade part! those dolls are adorable! i would lobe to win one. :) thank you! My daughter (15 month old Eva)...has just discovered dolls! She hugs and squeezes and kisses them! I'd love another doll for Miss Eva! These dolls are ADORABLE! My 5 year old daughter is looking at this post with me and just said, "mommy look, the blonde one looks just like me!" Then, she insisted that I put a side pony tail in her hair! My daughters would love those dolls! these dolls are so unique! I am going to try to link, if I can figure it out. I would love a doll for my daughter. These dolls are lovely! I'd love to win one for my 2 year old daughter! 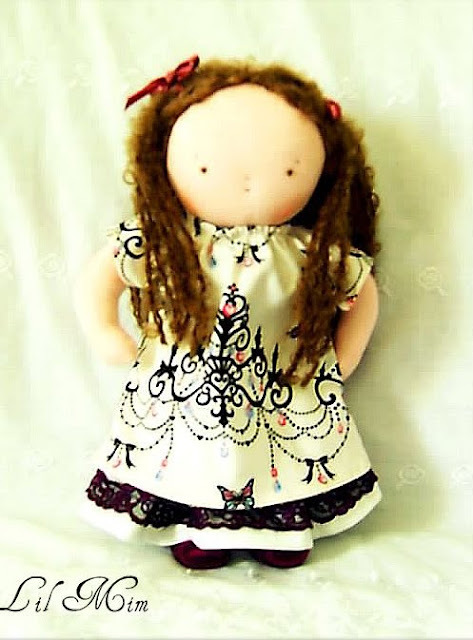 I think the Handmaden's dolls are so beautiful- the work and attention to detail is admirable, I would love to win one. Here is my comment to try to win a Lil Mim--they are my FAVorITE DOLL, bar none! I also made a link ! So cute. My Raggedy Ann and Andy would love the company! Very, very cute..so perfect for a little girl. I'm saving away things just like this for my future grandchildren. My baby Madeline is the only child in our family not to have a waldorf doll of her own. I know she would love this when she is a bit older. I'd love to win this sweet doll for my daughter. Very cute! I have a kindergarten student who is from Africa. (They are refugees) She has very few toys. I'd love to win this for her. I love her dolls, they are gorgeous! Thanks for the chance to win one! I'd like to win this for my daughter, thanks for the giveaway. i love these dolls and i know my daughter would love it!! thanks! I would love to have one of these dolls for my little girl who will be born in May. These are so cozy looking! I know my daughter would adore this "meme". She looks like someone to tell secrets to. darling. I know one little girl who would love this doll. OMG those dolls are absolutely adorable!!!!! I must have one!!! She is too cute! I'd love to win her. I have 2 lovely nieces that I would love to share this with! Such cute dolls. 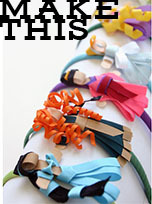 My favorite is the baby knot doll. These are adorable!! Any chance they have asian dolls?? My girls would love them!! Love these dolls. My blog has yours linked to it. Oh, my! I've never entered to win one of your giveaways before but Mim is my nickname for my daughter! We came up with it while reading Betsy, Tacy, and Tib. Please enter me! 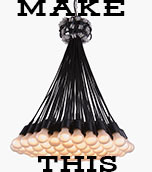 Oooh, I can't get enough handmade toy goodness! These are unique and beautiful. i truely love the handmadens creations. Please count me in! Beautiful dolls! Absolutely gorgeous! I am sure such a doll would be well loved addition to our family! My little girls would LOVE this! Since I have two, actually three, but the third is only 2 months old and can't hold her own in a fight yet, if I win, I'll have to buy another one! Such cute dolls! My granddaughter would love one! Somehow these dolls look even cuter than the handmade ones I've seen...more realistic maybe? My 3 yr old daughter would love one! my niece is in love with this doll! How adorable! My daughter would love any of these!! So so so cute.... we'd give her a very loving home!! These are darling! I must have one for my daughter. These dolls are beautifiul. I would love to win one. Adorable! I happen to have an adorable little girl who would love her!! Look at these creations - what amazing talent. Would love to gift one of these beatiful handmade dolls to my daughters. Might have to buy another one to satisfy them both. My four year old daughter (and her mother!) would love this doll. So cute!! Son lindísimas las muñecas. Gracias por dar la oportunidad de ganar una de ellas. 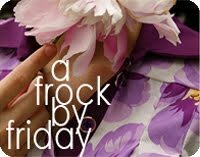 I have a surprise for you on my blog! What a beautiful doll! To be honest I would probably keep it for myself. I have a niece that loves dolls, but I would love this doll too much to give away! These are SO cute! My little girl would love this! She is just starting to play with dolls!!!! I love these little girls, we have two kiddos who are very* into pretend-play right now! My little Lily would just love this doll! They so adorable!! I love 'em!!! What an adorable doll! You can see that a lot of attention was paid to the details. I love them! So sweet! Oh my these dolls are beautiful. I showed my daughter and she loves them! I hope I win! I am also posting a link to my blog! Thanks Kathleen! What adorable dolls. The baby knot dolls are adorable as well. I just found her beautiful blog-these dolls are so charming. I love the styling, her soul comes through in these. My little girl would love one of these! My daughter would love these dolls! How cute! I am sure my daughter would love this doll! 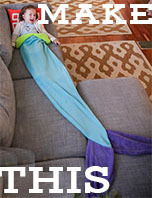 I would love this for my daughter. So very lovely! My little one would be thrilled.